In fry pan over medium heat cook green onions in 2 tbsp [30 mL] Lactantia Butter for 2 minutes; melt remaining Lactantia Butter. Add asparagus, tomatoes and spinach to fry pan; cook and stir until spinach wilts. Stir in basil and set aside. Fit two sheets of phyllo dough into a 9-inch [23 cm] flan pan, brush with a little of the melted Lactantia Butter. Fit another two sheets of phyllo in flan pan, brush again with butter. Repeat with the final two sheets of dough and spread honey mustard on base of flan. 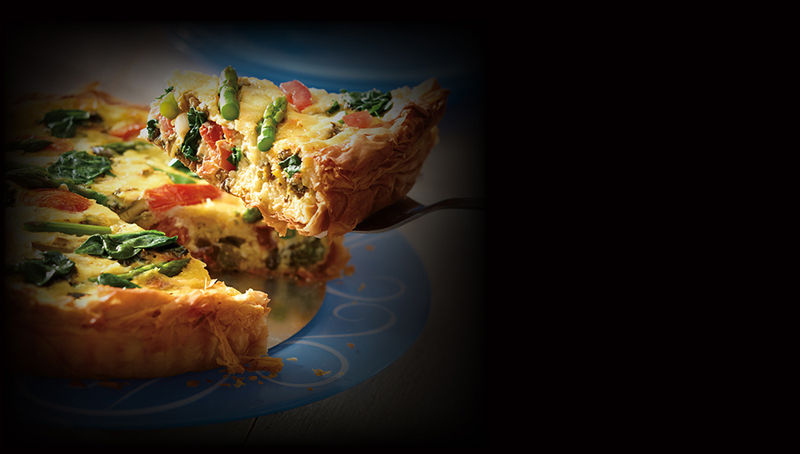 Mix together vegetable mixture and Balderson Heritage Cheddar Cheese, spoon into flan. Whisk together Lactantia Table Cream and eggs; pour over vegetable mixture. Brush over hanging phyllo with remaining Lactantia Butter; pinch the phyllo firmly to form a ruffled edge around tart. Bake in a pre-heated 425°F [220°C] oven for 10 minutes; reduce heat to 375°F [190°C] and bake for another 25 to 30 minutes until surface of tart is golden brown and custard is set. Serve warm, serves 6 to 8.